Your child may be a pro at staying dry during the day, but nighttime can be a different task altogether. Don’t get discouraged though, because nighttime is typically the part of the day that takes the longest for a child to master. But a little planning and patience can make it much easier for your tot to succeed. Prepare for nighttime. When it’s time for bed, take extra steps to make your child comfortable. 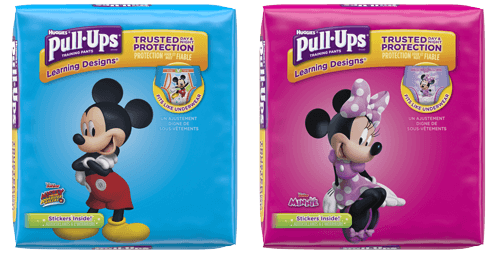 If your child needs extra protection at night, have him wear Pull-Ups® Night*Time Training Pants because they have extra absorbency and help maintain consistency with potty training. Also make sure that your child’s path to the bathroom is well lit — and free of toys. Keep a nightlight on in the bathroom overnight, so your child can find everything he needs. Limit fluids before bedtime. Some toddlers get used to taking a bottle or sippy-cup to bed to help get to sleep. But this can cause your tot to have to go potty during the night. Avoid leaving full cups of water near the bed, and instead offer one small drink of water to your child before you tuck her in. Attitude is everything. After a dry night, celebrate! Make your child’s favorite breakfast and let her watch a favorite video. You can even call Grandma with the good news. While your child likely hasn't any control over whether or not she has a dry night, she will learn to associate a dry bedtime with other great things, and will make that extra effort to become fully trained! Make sure that your child’s path to the bathroom is well lit — and free of toys.